Notable period of Low volatility and non-trending movements in the financial market is considered as Sideways Market. Sooner or later, the low volatility will increase and the price will pick up a trend after Sideways Market. In terms of trading point of view, Sideways Market can serve as the very good entry timing for traders. Sideways Market is also quite often the representation of accumulation of large orders from big investors. Therefore, knowing the presence of Sideways Market can help you to decide good entry and exit timing. 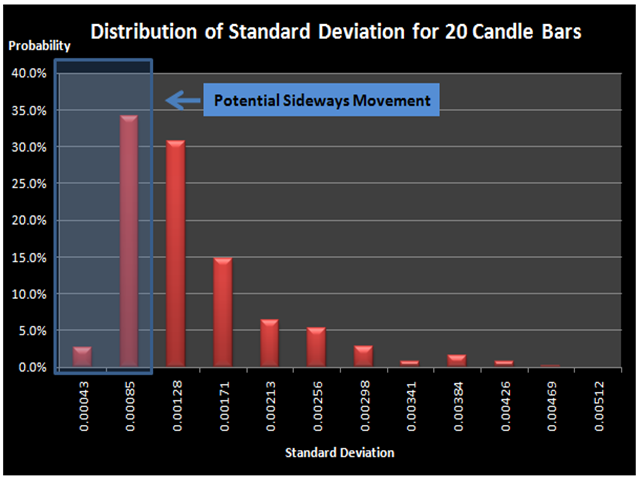 Traditionally, the Average Directional Index (ADX) indicator or moving average of standard deviation indicators was used to roughly determine the presence of Sideways Market. However, both of the indicators are lagging with very low correlation with future price movement. They will not provide you clear idea on when the Sideways Market started and when it ends. Missing all these important information leaves traders with a very uncertain picture on the current market situation. Here we have very accurate Sideways Market Analyzer inspired by the statistical theory. Indeed, this Sideways Market Statistical Analyzer can detect Sideways Market just like human eyes can do. 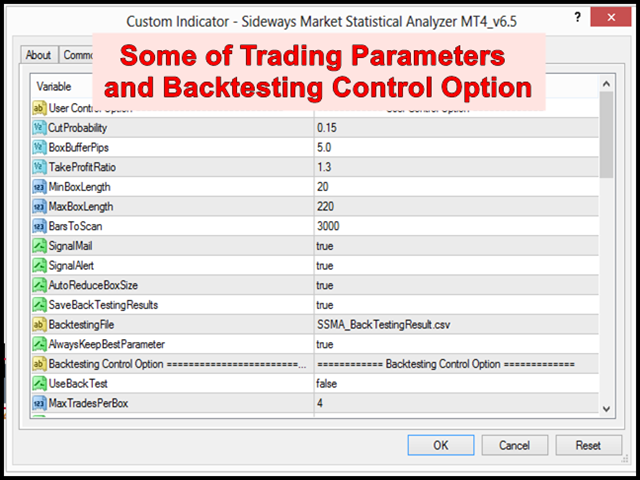 In addition, this Sideways Market Statistical Analyzer will immediately provide the expected trading outcome when you trade with the detected Sideways Market. Therefore, you will know how much profits/loss you should expect when you trade with the detected Sideways Market. 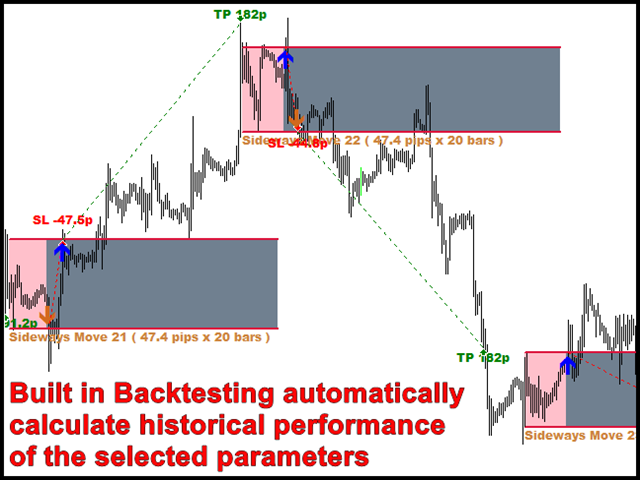 Based on 9 month backtesting results, you can expect 300 pips to 1 000 pips each month when you trade with this Sideways Market Statistical Analyzer. In terms of trading signal, you open a buy order when the price hits the top of the Sideways and you open a sell order when the price hits the bottom of the detected Sideways Box. 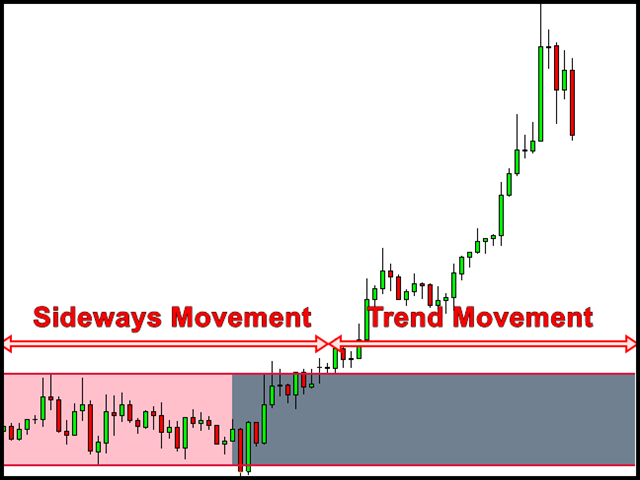 Sideway Market Analyzer provides you with a fixed stop loss and take profit levels. Sideways Market Statistical Analyzer works well for most of the currency pairs. Here are some backtesting results for 9 month period on five currency pairs. Trading five currency pairs, you could expect 300 pips to 1 000 pips each month. These trading results are purely based on the assumption that you open buy and sell orders when the Sideways Market is detected without looking at any other indicators. Of course, by making additional judgement using other technical indicators, you can remove bad trades and increase your profits even further. For XAUUSD (Gold), Cut Probability = 0.15, Box Buffer Pips =0, Take Profit = 1.3, Lot Multiplier = 1.6 return the total Net Pip gains of 27 265 pips during 9 month period and Monthly pip gains is 2 870 pips. So, it works very well for Gold, too. Cut Probability – you can enter from 0.01 to 0.99. The value will mostly stay between 0.05 and 0.5. 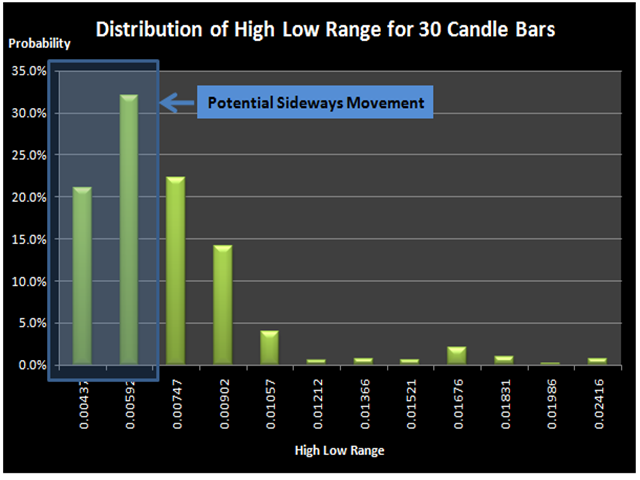 This cut probability is the criteria to qualify the Sideways Movement of the current group of candle bars based on the probability distribution. 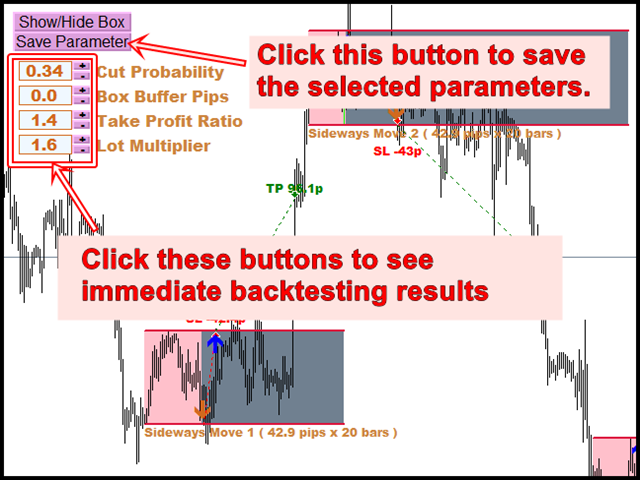 Box Buffer Pips – you can enter from 0 to 100. The value will mostly stay between 0 and 10. The pip value is the offset distance from the detected Sideways Market. This will be represented by the long horizontal line above and below the detected Sideways Market on your chart. 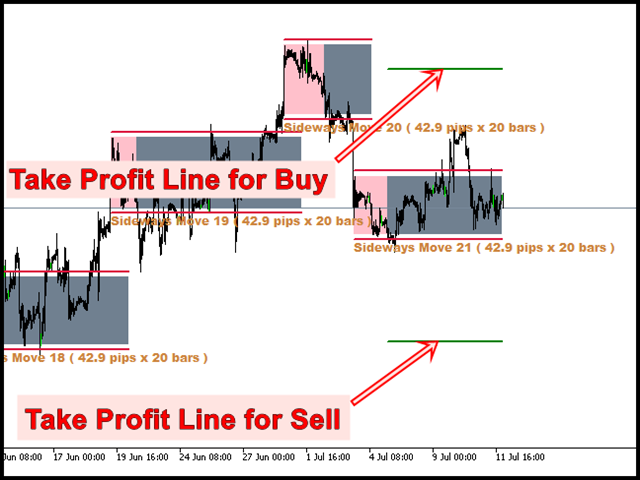 This line can be used as the trigger point for your buy and sell orders. 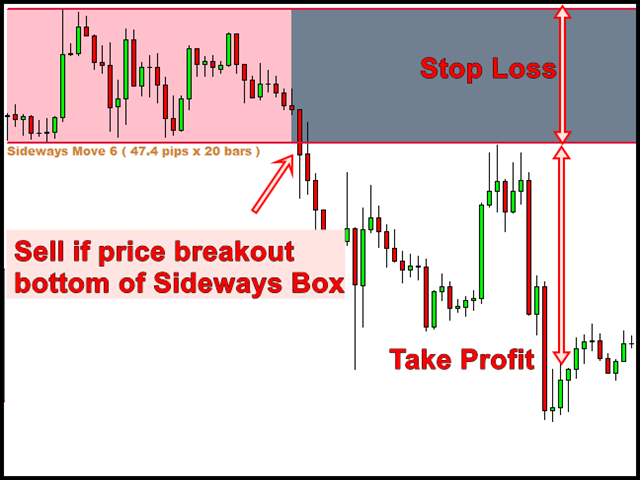 Take Profit Ratio – the Ratio of your take profit pips/box height. The value will mostly stay between 1 and 3. 1 indicates that your take profit's pips are equal to the height of the box. Lot Multiplier – Lot Multiplier is used when your previous trading hits stop loss. The value will mostly stay between 1.5 and 2.0. It is recommended to use the value less than 1.7. Just like Harmonic Pattern Plus and Price Breakout Patterns Scanner can be combined together for superb results, Sideways Market Statistical Analyzer can be combined with any of these two tools. All three tools can even be combined together. I found that Sideways Market is often detected at the same time as big harmonic patterns and breakout patterns. When they form together, the prediction power of such a pattern is highly accurate. 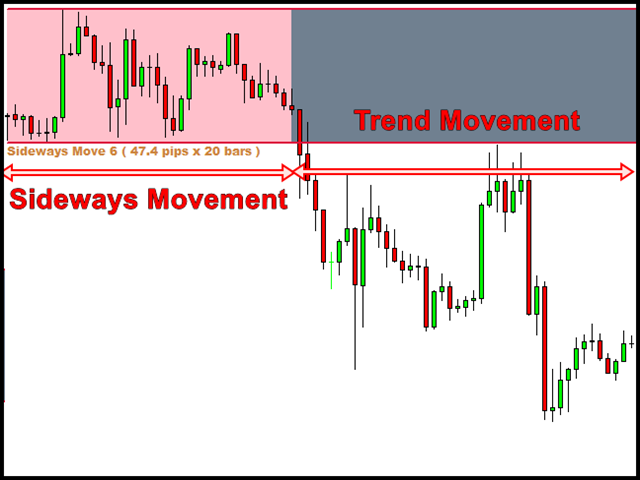 In this web page, I show you how these patterns work together to form your own ultimate trading strategy. You can get further support and information about Sideways Market Statistical Analyzer on this Web page. In the version 8.2, If you set the ButtonTextSize = 0, then you can hide buttons from your chart. Really minor update. This is useful feature for user with small screen device. In version 8.6, Back testing Spread in pips input was added. Now user can control spread for its back testing simulation. 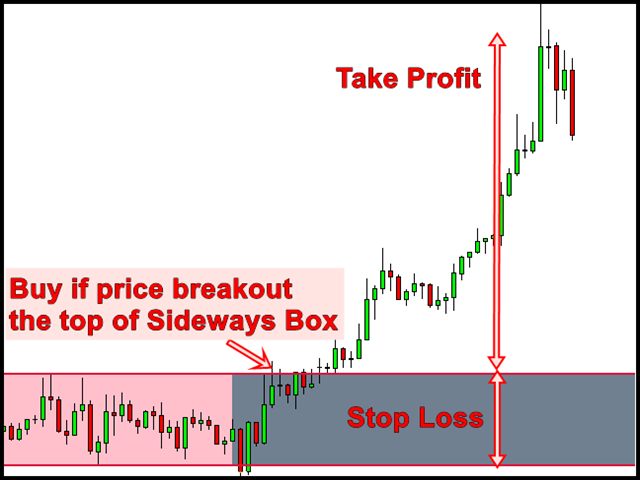 Break Even Success Rate was added to help traders for high precision trading entry. In version 8.0, two buttons added. Button PA: Switch on and off Stats Panel from your chart. Button BT: Hide and show buttons from your chart. In version 7.7, you can hide the Statistical panel from your chart. Just set DisplayStatsPanel = false. In version 7.5, detailed trading statistics for each entry was added. This means that now traders can make use of this information to decide, at which entry they should stop trading to maintain their best profit level. In version 7.2, Box Core Lines are added. Box Core lines are defined by Core Line Ratio in regards to Box Width (Core Line Width in pips/Box Width in pips). This Box Core Lines can be switched on/off using Core line Ratio variable. To Switch off, just set Core Line Ratio = 0.0. If you set Core Line Ratio = 0.1, this indicates that Core line gap between upper and lower lines are 10% width of Sideways Box. Default Core Line Ratio = 0.1 (10%). 2. Added ability to change button text size (Button Text Size variable). In this version, Backtesting Display panel was redesigned. In version 6.7, now you can select different symbols using buttons on charts. Users now need to open fewer charts and their trading operation become quicker.